Promise Rings – The Current Fuzzword To Strengthen Your Bond. Promise Rings – The Current Fuzzword! You are eighteen and in love, you don’t know what the future holds for you both, but at this point, you think that you definitely have a future together. If words are not sufficient to express the love you have for her, then, why not slip diamond promise rings on each other’s fingers to probably seal a future together and be forever together. 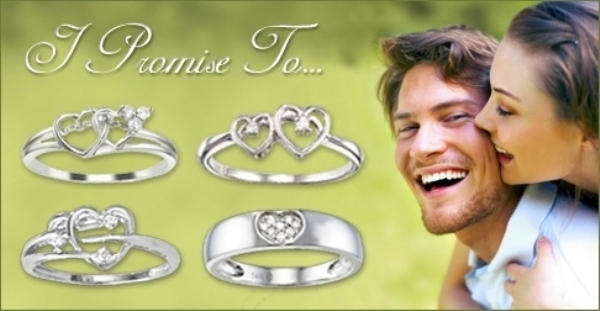 You can also wear promise rings as a symbol of your affection to one another. It is difficult to give an accurate definition of a promise engagement ring, so, feel free to give those unspoken promises your own meaning. When to Present a Promise Ring? Every relationship goes through different phases in life. Each stage is a sort of test for that relationship. Let’s discuss these stages to give you a superior understanding of a relationship. This is the primary stage of any relationship. You meet her for the very first time and are totally affected by her. You end up thinking about her at all times and have this uncontrollable wish to spend more and more time together. Now you see only the good things about each other. Spending some extra time with each other means getting to know each other’s perspectives, whims, and fancies better. You talk about her likes, dislikes, interests, family and a whole lot of other beauty secrets. Life is so beautiful and romantic at this phase. Remember the first fight or dispute that you had with your partner? It is a conflict that will distract you a lot, although you will attempt to sort out the differences fast. All relationships have their share of clashes of opinion; maturity lies into dealing with such conditions with a calm head. 4. The Opinion and Molding Stage: By the time your affair reaches this stage, you have already created an opinion about each other and know exactly what to expect from the relationship. In your mind, you have an appearance of an ideal partner, and accordingly, you want to try and mold your partner to fit into that perfect image. This stage can be very tricky for any relationship, and if both of you are stubborn, then it could lead to a split-up. If your relationship survives the molding stage, then don’t let go; this relationship is for saving! You are happy and you feel like you have found the perfect match; this is the stage where you can express the most valuable promise in your life and slip a diamond promise ring onto her fingers. These stages are just like stepping rocks into a relationship that is expected to be full of fun, love, and happiness in the future. When you are in love, you are constantly looking for ways to make her smile. You are happy when you see her happy. 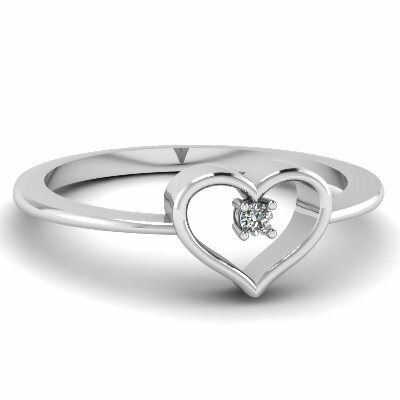 Express the endless love you have for her buying her a gorgeous promise ring. Give it to her at a nice romantic dinner. If you are confident of your feelings and want to make a long-term commitment, then go right ahead and buy her a promise diamond ring. Is it an engagement ring that you want to buy? 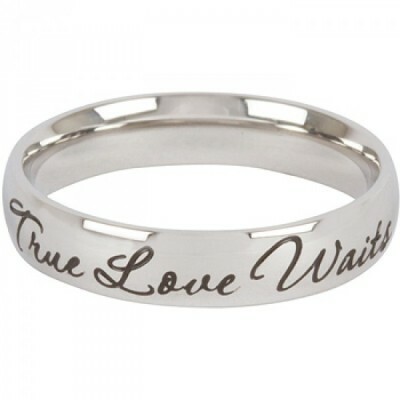 Or, is it just a ring to prove your love and commitment and let her know that you will love her forever? 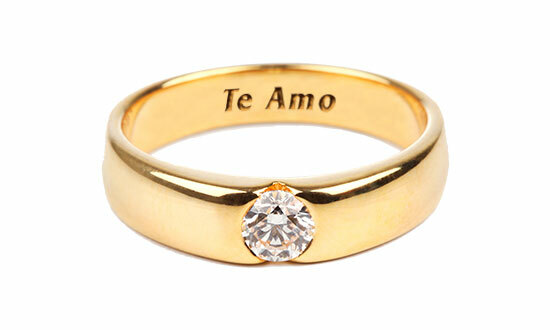 Then, be absolutely sure of the message you want to deliver with a loving promise ring meaning. Don’t leave it for her to analyze things on her own as it may lead to many obstacles in your relationship. You are young and not yet economically independent for marriage, but you feel so much love for her. You want to transfer it all through a gesture that will amaze her? Then there is nothing better than diamond promise rings! 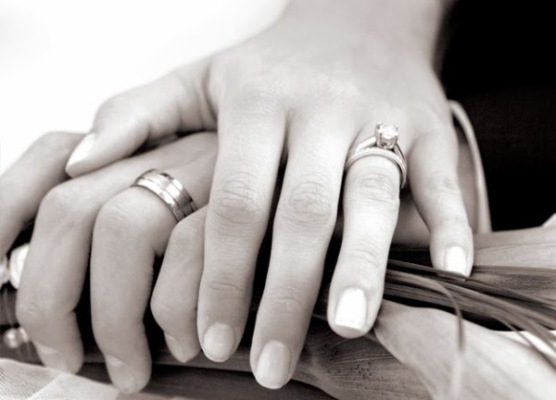 Giving a promise wedding ring to your sweetheart is a serious decision. By any means, please don’t buy a promise ring that looks like a wedding band. Otherwise, you might just frighten her away. You don’t have to go overboard; instead, buy something simple that will last for a lifetime. Mainly, state your promises clearly. 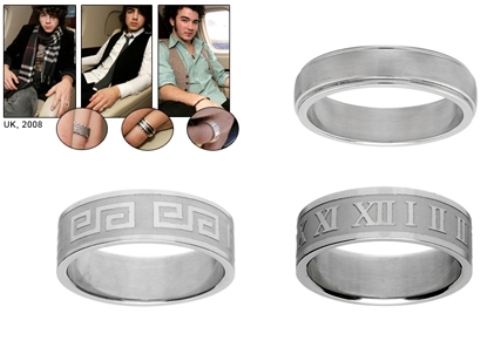 Remember, the focus is not on the ring; it is the promise rings meaning behind the promise that is being made. There are no general guiding rules for promise rings to be worn on any specific finger. They can adorn any finger. If you want to avoid any confusion about an actual diamond engagement ring, then you may wish to display a promise ring on the middle finger or on the ring finger of the right hand. 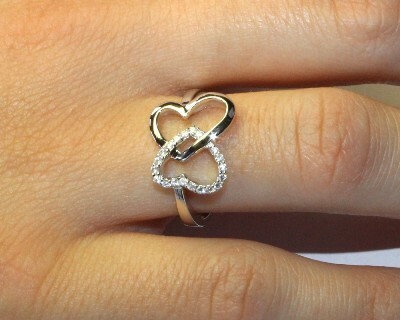 But again, promise rings can be used on any finger that you are feeling comfortable with. 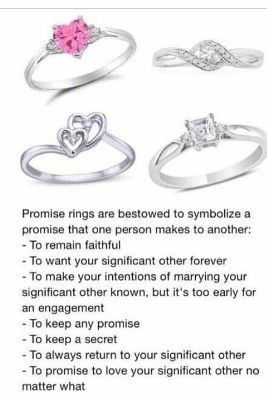 Traditionally, promise rings had heart design on them. 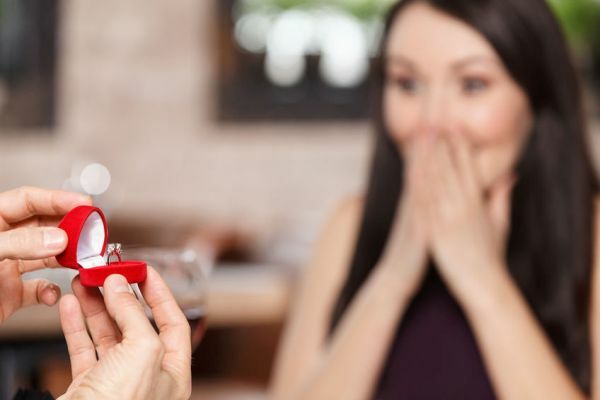 If this is not an issue for your finances, then you can design a promise ring with two differently colored heart shaped diamonds seated on white gold or platinum with the help of a Jeweler. Now, wouldn’t that make for a gorgeous diamond promise wedding ring? Some people think that promise rings are a complete waste of time. It is like asking for a girl to make a promise even before the guy is ready to commit himself to the relationship. It’s like making a declaration so that other guys back off, all the while not absolutely promising the girl any commitment from his side. It doesn’t appear fair, does it? Well, it is your call. You don’t certainly have to go by what others feel or say. Go by your intuitive feeling and do what you feel is fair. Just go ahead and buy that glorious diamond promise ring for the girl of your dreams. 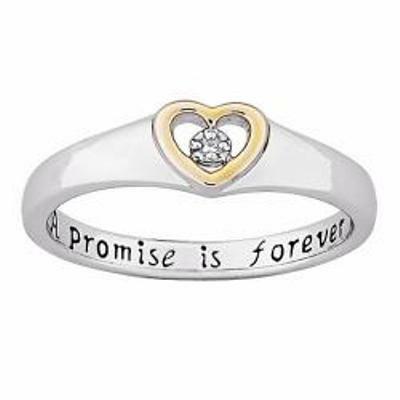 Feel free to demystify the message behind the promise ring according to your own feelings!